Menulog delivers for KFC - Miranda so you'll be able to track your courier on a map. 6 x Original Recipe Chicken, 6 x Nuggets, 3 x Original Tenders, 2 x Large Chips and 2 Sauces. 2 x Original Recipe Burgers, 2x Original Twisters, 2 x Large Chips, 1 x Regular Popcorn, 6 x Nuggets and 1 x Sauce. 10 x Original Recipe Chicken, 2 x Large Chips, 1 x Large Potato and Gravy, 1 x Large Coleslaw and 1.25L Drink. 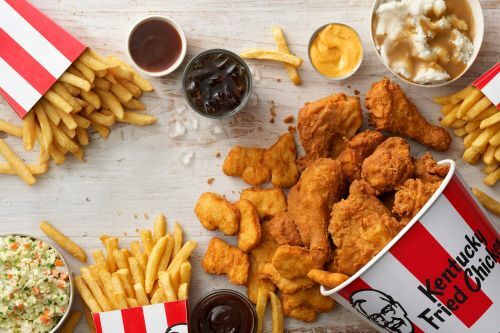 6 x Original Recipe Chicken, 1 x Regular Popcorn Chicken, 8 x Original Tenders, 6 x Nuggets, 1 x Honey Mustard Shaker Salad, 2 x Large Chips and 3 x Aioli Sauces. 15 x Original Recipe, 18 x Nuggets, 3 x Large Chips, 1 x Large Potato and Gravy, 1 x Large Coleslaw, 1.25L Drink and 3 x Sauces. All Boxed Meals include Regular Chips, Regular Potato & Gravy and Regular Soft Drink. 1 x Original Recipe Burger and 1 x Original Recipe Chicken. 1 x Zinger Burger and 3 x Wicked Wings. 3 x Original Tenders, 1 x Snack Popcorn Chicken, 1 x Aioli Sauce. 3 x Original Recipe Chicken and 1 Dinner Roll. 1 x Original Recipe, 1 x Original Tender, 1 x Wicked Wing, 1 x Snack Popcorn, 1 x Slider Aioli, 1 x Regular Chips, 1 x Regular Potato and Gravy and 1 x Pepsi Max. With Regular Chips and Regular Drink. With Regular Chips, Regular Drink and Aioli Dipping Sauce. With Regular Chips, Regular Drink and Sweet n Sour Dipping Sauce.